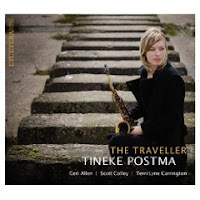 The Traveller - Tineke Postma (EtceteraNOW) - This is Dutch saxophonist/composer Postma's 4th CD as a leader and it's a delight-filled 55+ minutes of music. One can hear the influence of Wayne Shorter in her fluid soprano saxophone work, her open compositions and sense of sonic adventure. Joining her are pianist Geri Allen, bassist Scott Colley and drummer Terri Lyne Carrington (who appeared on the saxophonist previous CD), a splendid rhythm section. 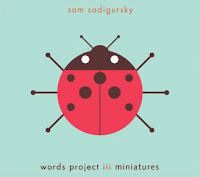 On the opening track, "Song for F", Postma plays call-and-response with her soprano and alto saxophone - the wordless vocals of Anne Chris (fellow Dutchman, solo artist with a release on Challenge Records) adds another sweet color to the mix. Allen's solo is a delight as well, ranging from short, single note phrases to longer melodic flights. Chris returns on "Adagio 13 - Heitor Villa Lobos", working with and below the soprano on the theme and solo. The rhythm section moves effortlessly below the front line. There's not a weak track on this recording. 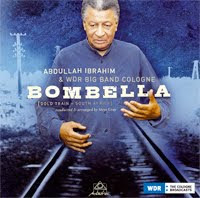 Everyone plays with grace and intensity, the compositions have strong melodies, and the solos are seemingly free of cliche. On subsequent listens, the influences drop away and what remains is very good music, a balm to the hardships of daily life. For more information, go to www.tinekepostma.com. 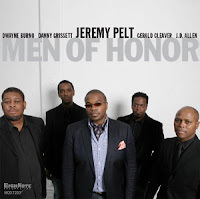 Men Of Honor - Jeremy Pelt (HighNote Records) - The influence of the mid-60s Miles Davis "Classic Quintet"(with Wayne Shorter, Herbie Hancock, Ron Carter and Tony Williams) continues to be strong 4 decades after its demise. This new CD from trumpeter Pelt shines with similar limpid melodies, open arrangements, crisp solos and an attentive rhythm section. Like Davis, Pelt is surrounded by intelligent players, the fine tenor saxophonist J. D. Allen (whose 2 trio CDs on Sunnyside are excellent), emerging talent Danny Grissett (piano), veteran bassist Dwayne Burno and drummer Gerald Cleaver. The leader makes sure that every one of the band members contributes, at least, one tune. Cleaver's "From the Life of the Same Name" is a sweet ballad with a heartfelt tenor solo, rich piano chords, and lyrical trumpet work. Allen's "Brooklyn Bound" moves atop Cleaver's active yet shimmering percussion and Burno's melodic bass lines. 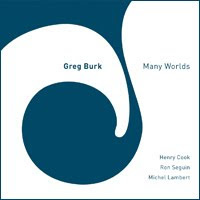 The saxophonist writes such compact pieces with short solo sections that always leaving you wanting more (Pelt's lovely flugelhorn solo is so sweet and gives way to Grissett's introspective spot.) "Milo Hayward" (named for the trumpeter's baby boy) is lively, with active drumming and sprightly solos. Only one of the tracks is over 7 minutes (and two are under 5) so the band wastes little time; still, the music never feels rushed (Pelt's "Illusion" is just 5 minutes yet feels complete.) The way in which the band works together to create this music is intimate and far from "manufactured" - this is a working group. Like the Davis Quintet, this recording is a blueprint for live gigs. The songs can be stretched, rearranged, even shortened, the compositions are that pliable. Until one can see this quintet in concert, "Men of Honor" is a sweet treat and an excellent follow-up to the band's debut recording from 2008, "November" (MaxJazz.) For more information, go to www.peltjazz.com. 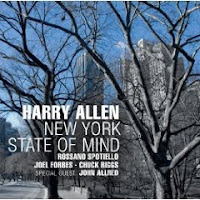 New York State of Mind - Harry Allen (Challenge Records) - I've played this disk several times at gatherings where non-jazz listeners are about and just about every one perks up their ears. Why not? Saxophonist (*see note below) Allen's collection of tunes, all related to The Big Apple, swings with great verve and sparkles with inspired playing. Pianist Rosano Sportiello is a new name to me but he's quite a find. His command of different styles reminds me of Jaki Byard - he can play stride with elan and absolutely caresses ballads (such as "Autumn in New York.") The rhythm section of Joel Forbes (bass) and Chuck Riggs (drums) is unobtrusive yet swings with panache. Trombonist John Allred appears on 6 of the 11 cuts and his burry tone is a smart match for Allen's sometimes clean, other times breathy, tenor sound. Allen's playing certainly has its roots in Coleman Hawkins, Ben Webster and Lester Young - I know that but the average listener doesn't and so what if they don't. My friends like it because the music, no matter the tempo, is so melodic. Allen and the band don't challenge one by "pushing the envelope". Instead they play songs that often sound deceptively easy. On one level, they might be. Yet few musicians can play "Harlem Nocturne" so slowly without wanting to rush the beat. Here, the quartet just caresses the melody and creates a true nocturne. Then they turn around and "swing" the heck out of "Broadway Melody"with such joy. The title track features one of Allen's finer solos, hard to describe but easy to fall under its spell of bluesy phrases and long tones (quite like later period Ben Webster.) Sportiello's solo on the track is so pretty, introspective without being cliched. 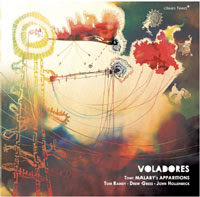 "Chinatown, My Chinatown", to some, may be a "moldy oldie" but here it sounds fresh and inspired, especially the hearty exchange between sax and trombone. "New York State of Mind" is a fun experience, the kind of recording that brightens the day with its spirit. The rap against jazz is that nobody goes to concerts anymore yet look at the continued popularity of "trad jazz" festivals in the summer. There are some mighty fine musicians whose inspirations reach back several generations and who are keeping that the traditions alive. Allen and company do just that and it makes for good listening. For more information, go to www.harryallenjazz.com. 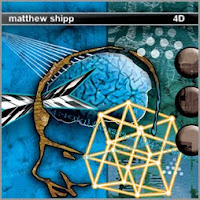 4D - Matthew Shipp (Thirsty Ear) - There are few contemporary pianists like Matthew Shipp. He's one of those players whose style one cannot easily pigeonhole and one who, I think, is best served in a solo setting. I know he's made dozens of recordings in small group settings (many of them are quite good) but it's really fun to listen to him alone. At just under an hour, "4D" should really be listened to uninterrupted. Nothing is overworked or overbaked and, depending on your mood, you'll hear new things on each listen. The title track opens the program and sets the stage. Melodic and forceful, yet contemplative and exploratory, the piece is a guide to Shipp's probing mind. He's been on the scene for over 2 decades and keeps the listener off-guard and interested with his choices. Later in the program, Shipp plays several standards such as "Autumn Leaves" (a take reminiscent of Art Tatum in the way the pianist moves the rhythm along and dances through the melody) and a probing version of "Prelude to a Kiss." There's also a "deconstruction" of "Frere Jacques" and a short (:54) and sweet "What A Friend We Have in Jesus." If these tracks (plus "Greensleeves" and "What is This Thing Called Love?") were placed upfront on the disk, one might think these are pieces that have influenced Shipp's development. Instead, coming in the second half of the program, and the fact he's not a novice, I believe this is just the way the pianist's mind works when he sits at the keyboard. Shipp knows exactly what he is doing and the listener is free to interpret the "why?" anyway he or she wants. Matthew Shipp is intelligent, assured and outspoken (his interview with David Adler in the January/February issue of JazzTimes is enlightening and provocative - read it here) and one can hear it in his music. He displays no fear, no worry about his place in the jazz continuum, no making it palatable for gentle ears - drop your expectations when you come to "4D", get into Shipp's flow and the rewards are great. 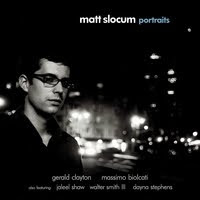 For more information, go to http://matthewshipp.com. Forty Fort - Mostly Other People Do The Killing (Hot Cup 91) - Bassist/composer Moppa Elliott began Hot Cup Records almost 9 years ago as a student at Oberlin Conservatory. 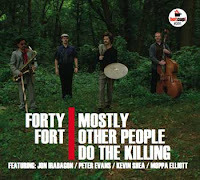 "Forty Fort" is the fourth CD by his main vehicle, MOPDTK, a quartet featuring Jon Irabagon (alto & tenor saxophones), Peter Evans (trumpet) and Kevin Shea (drums, electronics.) The music is rousing, raucous, noisy, at times respectful, witty, and filled with tremendous interplay. The witty part starts before you even play the music. The cover is a recreation of the Roy Haynes "Out of the Afternoon" Lp from 1962 and the liner notes (penned by one "Leonardo Featherweight") spend much of the time discussing recreating the album cover. The music within is not a recreation of the Haynes Lp but a marvelous blend of many different musical styles. In the first minute of the opening track, "Pen Argyl", you know this is no ordinary post-Millennium "hard bop blowing session." From the funky bass line to Shea's drum barrage to the melody lines that scramble and shake up the listener, the overall experience is "hot." The tempo changes on a dime, with moments that sound like Louis Armstrong Hot 5 that give way abstractions along the line of the Art Ensemble of Chicago to funky breakdowns a la Tower of Power (and that happens in the first 3 minutes of the disk.) 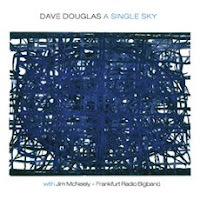 "Rough and Ready" has a melody line and rhythmic attack that reminds this listener of Les McCann's "Compared to What?" but, of course moves out into a hard-blowing solo section in which Evans and Irabagon smoke over Shea's rampaging drums. (Something I read compared the drummer to Gene Krupa - to my ears, he's much more like Keith Moon of The Who, able to shift gears in a instant, with great propulsion.) There are quiet moments such as the melodic opening of "Blue Ball" but, all the while, Shea's threatening to explode beneath the sax and muted trumpet lines. There's a long abstract section in the middle including a rhythm-less flurry of notes, bowed bass and splashy cymbals that lasts until the song ends (all the while, one expects the quartet to drop back into the theme.) The title track begins in a "swing mode"and, of course, continues to evolve over 8:29 seconds. "Forty Fort" may remind some of the "anarchist music" of the Willem Breuker Kollektief but this music can also be compared to James Joyce's "Finnegan's Wake" in that MOPDTK creates their own language out of the shards of multiple musical styles. At times breathtaking and overwhelming, exhausting and ebullient, "Forty Fort" will knock your socks off - if not, check your pulse. 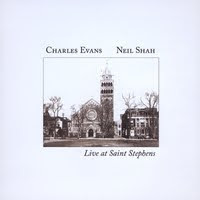 Live at Saint Stephens - Charles Evans/Neil Shah (Hot Cup 92) - Baritone saxophonist Evans and pianist Shah have been friends for years and this concert displays their comfort with each other in many ways. 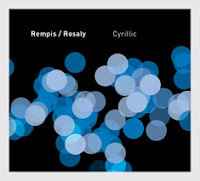 One can always try to create music that is a display of technical prowess but this duo wants the listeners (both in the setting of the live concert and the person who purchases the disk) to hear a conversation, a dialogue that goes in many directions and does so without artifice. Yes, this is composed music and yes, it has moments of improvisation and yes, you do not need to classify it in any one style (jazz, classical, pop, whatever.) This is hard music to explain to the reader because it eschews classification. Longer pieces like "On Tone Yet - Parts I, II, and III" serve to show Evans' versatility on his instrument, the clarity of his high notes and the way the duo uses silence to balance the music. Shah can be quiet and economical as a accompanist and forceful when in the spotlight. "Mono Monk" is the shortest of the 6 tracks (4:34), the melody and spare piano accompaniment perhaps influenced by the jagged lines of Thelonious Monk. Nothing is rushed, the bell-like piano chords supporting the bluesy baritone exclamations. 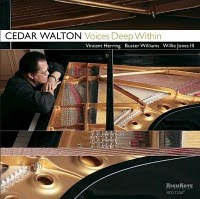 This CD only demands that one pays attention - the creative listener will enjoy the journey. 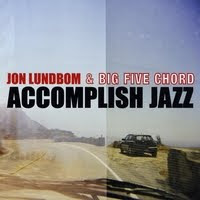 Accomplish Jazz - Jon Lundbom & Big Five Chord (Hot Cup 93) - On this, guitarist/composer Lundbom's 3rd CD as a leader and first in over 4 years (and his debut on Hot Cup), features long-time associates Jon Irabagon and Moppa Elliott, tenor saxophonist Bryan Murray (his 2nd CD with the guitarist) and drummer Danny Fischer (making his recording debut as a member of the quintet. The music is spacious and swinging, occasionally raucous and hard-edged with solos that push at the boundaries of the songs. To this listener, Lundbom's guitar style sounds influenced by both Joe Morris and James "Blood" Ulmer, the former in the way he controls volume and in the movement of his phrases and the latter in the underlying blues foundation of his lines. "Truncheon" opens the CD and, with a title like that, one might expect it to beat the listener over the head. But, it's a bluesy shuffle with a long guitar solo that pushes the rhythm section to react in a forceful way and sets the stage for Irabagon's fiery and edgy solo that brings the piece to a close. "Phonetics" starts quietly with a short melody line for both saxophonists that splits and comes back together, then opens for Irabagon's multi-dimensional solo (most of the time over a pulsing bass line.) This time, Lundbom takes the second solo and it moves from quiet, short, phrases to jagged riffs that ring both clear and bluesy. There's a touch of Bill Frisell in the guitar lines that lead the saxophones back in to a reiteration of the opening theme. I like how this music can be so quiet yet so intense. The Frisell influence continues with the sweet bluesy reading of the Louvin Brothers' "The Christian Life." Elliott and Fischer play so economically and clearly beneath the soloists, with the bassist getting a long time in the spotlight near the end of the track. "Tick-Dog" opens with a long guitar ramble before Fischer makes it a dialogue for several more minutes, raising the intensity level. Nearly halfway through the 10 minute piece, the rest of the band comes in and Murray blows a long, hot, tenor solo. The final track, "Baluba, Baluba", rides in on a funky drum and bass rhythm, crisp guitar lines and saxophone lines out of a Stax recording. Irabagon gets the first solo, flying and sputtering phrases over the hard-edged rhythm section. Then, Murray and Lundbom engage in a dialogue that starts as a good-natuured give-and-take then goes out in a blaze of glory. Judging by the sounds emanating from this recording, Jon Lundbom and his musical posse had a great time making "Accomplish Jazz." Listeners with a mind for adventurous music that does not necessarily stick to an obvious format should have great fun making their way through this musical playland. For more information about these and other Hot Cup releases, go to http://hotcuprecords.com.